To revisit these premises to investigate and hopefully record alledged ongoing paranormal activity. 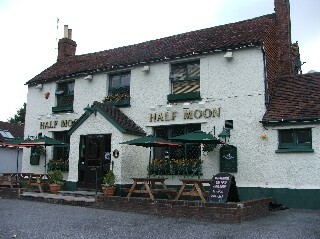 The Half Moon is an old coaching inn which used to service tired travellers whilst on their journey along the toll road between London and the south coast. First built in the 16th century it was extended to the rear to provided stabling in the 17th century and again expanded, this time to the front, to provide larger accommodation in the 18th century. Many customers, inn keepers and their families have passed through it's doors over the last four hundered years, which is why this is the sort of pub where one would hope to find the occasional wandering spirit. Ghost connections were contacted by Sharon, landlady of The Half Moon. Since our previous investigation in June of 2005 unexplainable occurrences had become more and more frequent and varied, and she felt it was about time we were called back in. Customers and staff were being poked, proded and touched by an invisible force, items were being moved about, and strange noises have been heard from the bar at night, which Sharon could only described as a pub full of customers enjoying themselves? She was in the pub on her own that night and decided not to investigate. Our last investigation prooved to be eventfull by the end and certainly led us to believe that there was some sort of activity going on, and as more and more customers and staff were becoming slightly nervous of the "happenings" at The Half Moon we felt we had to oblige and return. To see our previous investigation report please click the link below. Equipment was placed around the bar area. Two night vision CCTV cameras, one facing the upper seating area and old fireplace, one the other side of the bar facing the side and rear of the bar. 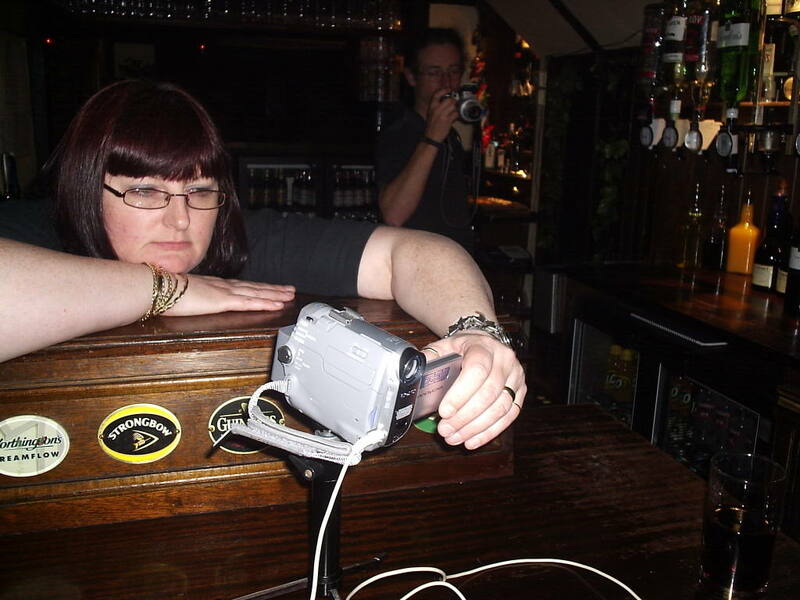 A Sharp PA- VR10E voice recorder was placed on the bar as was a trigger object of five old coins monitored by a locked of camcorder. Two other camcorders were locked off on tripods and moved around the venue intermittently so as to capture all aspects of the investigation. Motion sensors were placed either side of the main entrance. The group was to hold one main spritual experiment with all persons present before splitting into two groups and holding small silent vigils, including calling for spirit activity, in seperate parts of the pub. We had then planned to switch location and hold a further two seperate vigils before ending with some quiet time spent in the bar together. We only deviated from this plan slightly when Sharon and Densil retired after the first of the group vigils, so instead of another pair of group vigils we decided to stay together as one for the rest of the investigation. We didn't get in and start setting up till 00.15 but were ready with all the equipment set up and running by 00.55. The last piece of equipment to be placed was the motion sensors that Ian place across the main entrance, as he did so the door to the porch decided to open a few inches and close again, Ian tested for draughts and floor board movement that could have caused this but he could not recreate it?Apparently doors have been known to move on their own! We finally started at 01.15 going straight into the spiritual experiment, all were present seated around the round table adjacent to the conservatory entrance.Several taps were heard and a cold breeze was felt by everyone at some point, the breeze being felt aover the table and across people hands. The teperature at this point is 23.5 degrees centigrade. Sharon complained that her left arm was feeling very heavy and Ian said he had a headache coming on. Kim felt uncomfortable as though she was shaking and had to pull away from the group. There was a slight rise in temperature noted, now 23.6 degrees. Keith thought he felt something brush his finger then there was a thud heard from the front bar shortly followed by another, this was heard by the whole group. At 02.00 Dave continued to call for spirit and another draught across the table was felt by Keith. Dave begins to feel dizzy at this moment and Ian thinks he saw some slight movement from the front bare area immediately behind Dave. At 02.05 Denzil commented that he wasn't sure how he felt but that he was certain there was a presence then he also spots or senses there is movement in the front bar where Ian had noticed it previously. Sarah heard a rattling from behind the bar which could have been a noise from the coolers, but then heard a sigh from near the toilets. She then started to feel warm and sick. Sharon has four dogs who started barking in the back yard as they sometimes do but this time they didn't stop so Sharon went to investigate and could find no reason for the disturbance, but said that the lock on the gate was swinging? At 02.10 there was an odd creaking sound heard from an adjacent fruit machine followed by another cold draught moving around the table. The temperature remained unchanged. By this point it felt as though any atmosphere that was about had left us, but at 02.20 just before we stopped for a break Ians felt a thud again only this time not so much heard but felt through his feet as though something or someone had hit stamped on the floor? This sesion proved to be very interesting and ended at 02.20. At 02.50 whislt taking a break Ian was talking to Dave in the bar and Ian heard a metalic "rattle", maybe the same noise heard by Sarah during the spiritual experiment..
At 03.00 we split into two goups for the first of the planned group vigils, Ian leading Sarah, Sharon and Denzil ar the rear of the bar but the pool table, with Dave, Kim and Keith in the seating area up at the other end of the bar by the old fireplace. After five minuetes Sarah felt odd and sicky again as well as shaking so she had to leave the vigil. Sharon thought she heard the toilet door squeaking, which had been heard before, then ian and Sharon both hear what sounds like a sigh come from above the group? Ian's group all heard what sounded like shuffling and movement from the main bar area and sarah had the feeling that they were being watched. Ian's group called to the other group asking if anyone had been moving in the bar area but no one had, in fact they had heard the same noise themselves. Sharon said that she was begining to feel sick and at that moment Ian is captivated by some movement throught the fire exit window and what he thought was a figure in the car park? At the same moment Densil thought he heard a noise from outside. All Ian's team then thought they heard a voice before these sessions ended. At 04.00. Sharon and Denzil retired after this so after abreak at 4.40 the Ghost Connections team tried a group vigil back around the table used in the spiritual experiment, to try and recreate the activity felt during the first session. sarah sat this one out as she was feeling repeatedly unwell whenever we did this? More tapping and creaking was heard throughout the bar. Unfortunately this was not to be as nothing else seemed to be occuring, in fact the investigation had gone a bit flat by this point so at 05.10 we decided to call it a night and collect our equipment, the investigation ended and we left at 05.30. The night was made up of a series of unexplained and explainable noises, which certainly added to the atmosphere during the investigation. The feeling of being watched and the sense that there was movement in the bar area on more than one occasion was constantly with us. However, after reviewing our CCTV and camcorder footage there were none of these sounds caught in any or our recordings, and nothing was captured in our photographs. 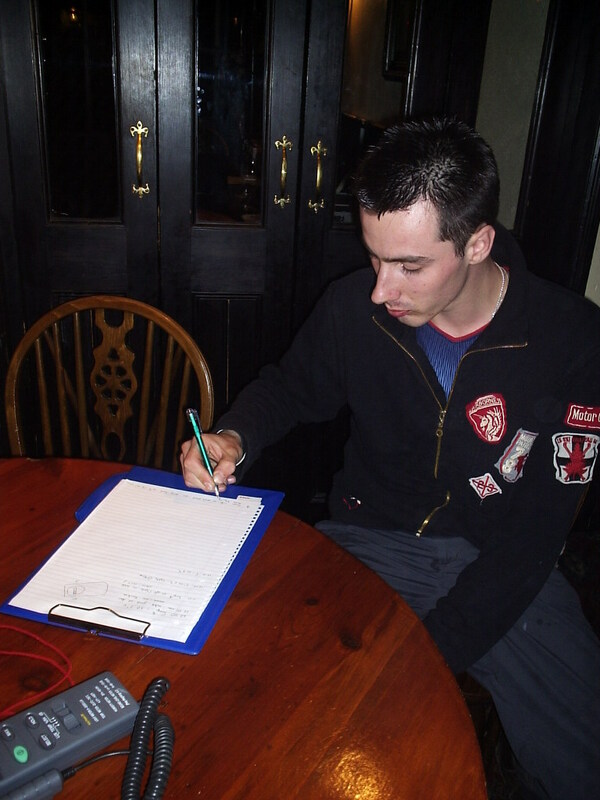 The EVP recording from the front bar has yet to be reviewed and this report will be updated once this has been done . There was a degree of information forthcoming of a clairvoyant/psychic kind but Ghost Connections conducts scientifically based investigations and does not publish any psychic or clairvoyant observations. However, this information is held on a separate database. Should you wish to see this information please email us at enquiries@ghostconnections.com. Although this information cannot be treated as evidence it at least gives food for thought, we will look further into this and try to validate some of the information that was presented. Any developments will be reported at a later date. Once again The Half Moon left us with more questions than answers. Did we achieve our aim? Partially. It was our intention to investigate, which we did, but we did not record any evidence of the alleged activity. It is very true to say though that this premises certainly have some secrets to unlock, this is one venue we shall be keeping in touch with. Once again many thanks to Sharon for her hospitality and letting us stay the night at The Half Moon, we look forward to being kept informed of developments!